In traditional mobile application development, you either require separate codebases for each device or built your mobile app in such a way that it can run through a web browser. The issue with the first approach is obvious: development and maintenance costs can be a nightmare. Your need developers who are fluent in Objective-C or Swift for your app’s iOS version and developers who are experts in Java for an Android version. We have not even considered C#, the language of Windows Phone apps. The issue with web-based mobile apps is that they don't run natively. As a result, the app’s UI is different from the device’s theme and performance is usually an issue. Xamarin application development offers a third alternative. It can be used to develop cross platform mobile applications, for iOS, Android as well as Windows Mobile. Businesses can get native-like speed on all major smartphones without writing code multiple times. You can hire xamarin developer from our team. We have already delivered projects for our US, Canada, Dubai, UK, India and Australia based clients. Although Xamarin mobile application development is a relatively new product, it gained such momentum in the last couple of years that Microsoft bought it in February 2016. Xamarin developers are really sought for these days and are hard to hire. Cogniter was one of the very first Xamarin Development Company in India and USA. Xamarin is a mobile app development platform for building native iOS, Android, and Windows apps from a common C#/.NET code base, achieving between 75% and 100% code reuse between platforms. Apps written with Xamarin and C# have full access to underlying platform APIs, can use native user interfaces, and compile to platform-specific packages so there is little impact on runtime performance. In the recently released Visual Studio 2017 15.6 preview Microsoft further smoothened out the experience of adding a Mac machine in the iOS development flow using Xamarin, thru an automation approach, but still there is a Mac machine needed. We follow all the latest updates in the Xamarin Development field. Cross-platform development on Xamarin is an order of magnitude faster than alternatives. We build native apps for iOS, Android, and Windows on a shared C# code base to provide same-day support for new OS releases. Experienced mobile developers are expensive. By hiring just one team (Cogniter), instead of three, to develop for multiple platforms, you can bring down development costs significantly. The savings can be 50 percent or more. 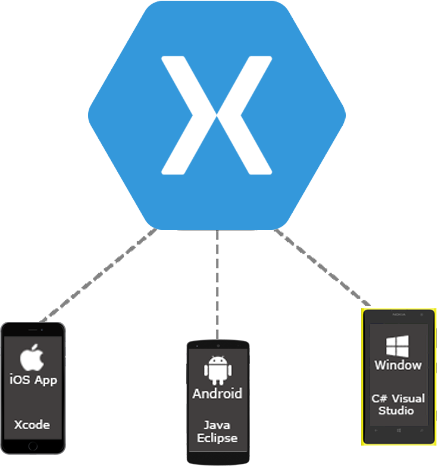 Xamarin matches fast native performance by leveraging platform-specific hardware acceleration and an extensive library. It comes packed with all the major features available in Objective-C, Swift, and Java. Xamarin powers us to find bugs quickly through testing on cloud with over 2,000 real devices. It also supports automated testing that behaves like users. CI integration is available for continuous automated testing. Beta versions, live crash reports, and real-time feedback from users are essential components of any development process. With its meaningful crash and bug reports, Xamarin allows us to develop robust mobile apps. With our teams spread across India, Canada, and the US, we are a in unique position to offer low-cost development coupled with support in their own time zone. Hire our Xamarin developer. Check out our Xamarin Portfolio. LeaseOurHouse.com (LOH) is the most complete and trusted end to end online resource in home rentals, that helps both landlords and tenants with everything throughout the entire rental process. Have you ever been in a situation where you return home empty handed from a medical store which ran out of your medicine or the store in your vicinity has a pretty odd timing to cater to your emergency needs? The application provides opportunity for the students to find the right tutor merged with charity services. The application will have two login - one for the tutors and the other for the students. The students can search for tutors in the application related to the help they are seeking. Delivered as expected. Unfortunately this project was put on hold by management for business-related reasons. But Cogniter will be the first Xamarin development company we will contact when this xamarin development project resumes.